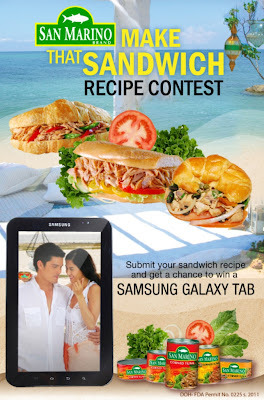 Home / contest / galaxy tab / make that sandwich / P1000 / recipe / samsung / san marino / sandwich / tuna / Make that Sandwich and Win that Tab! Make that Sandwich and Win that Tab! 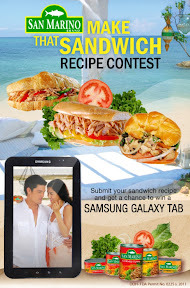 Share to us your top-secret tuna sandwich recipe, and who knows, you might be the lucky winner of Samsung Galaxy Tab with San Marino Tuna's Make that Sandwich Recipe Contest. Open to all Filipinos who are culinary professional or otherwise, huge fans of tuna sandwiches and have this hidden tuna sanwich recipe that can turn tuna-lovers' world upside down, this mouth-watering and tummy-filling contest will start accepting entries from March 2 to April 2, 2011. After that, six wonderfully tasting San Marino Tuna Sandwiches will be chosen to vie for the Facebook's most liked San Marino Tuna Sandwich. The judges from San Marino will choose the top six sandwich recipes that will qualify for the online voting. These top six sandwich recipes will be chosen based on orginality (25%), uniqueness (25%), creativity (25%) and the intergration of San Marino Corned Tuna or Chili Corned Tuna products (25%). The announcement of these six finalists will be on April 5, 2011. These top six participants will advance to the final stage and they will be required to submit photo/s of their tuna sandwiches that will be used for the online voting. The photos of these sandwiches must be orignal and unedited. The voting period on facebook will run from April 6 to 28 and the winner will be announced on May 2, 2011. The winning sandwich maker will bagged a Samsung Galaxy Tab P1000! Wee! And may we all get a chance to taste those sandwiches!